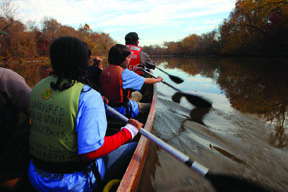 Based on research by the museum on the history, public use, and attitudes toward the Anacostia River and its watershed and on review of urban waterway developments in Los Angeles, Pittsburgh, Louisville, London, and Shanghai, Reclaiming the Edge explores various issues regarding human interaction with natural resources in an urban setting. It looks at densely populated watersheds and at rivers as barriers to racial and ethnic integration. The exhibition also examines civic attempts to recover, clean up, re-imagine, or engineer urban rivers for community access and use. Seventy-five objects, 16 artworks, and 170 images are featured. Highlights include artworks by Chinese artist Zhang Jian-Jun, Chicano artist Leo Limon, and local artist Bruce McNeil, The opening of this exhibition kicks off the museum's 45th anniversary.